At 4,235 feet in elevation, Killington Peak is second highest peak in Vermont, as well as one of the highest in all of New England. 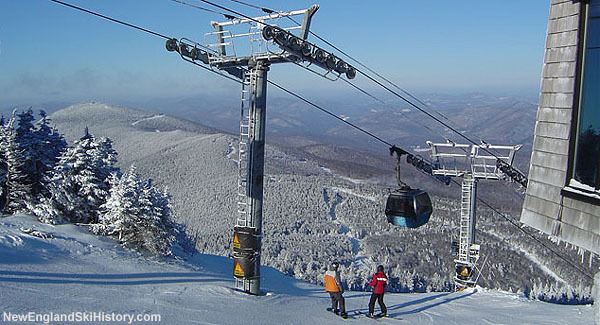 Killington Peak is perhaps best known as being home to Killington Resort, which is by many measurements the biggest ski area in the Northeast. Initially interested in purchasing Ascutney, aspiring ski entrepreneur Pres Smith was persuaded by Perry Merrill to look into developing a ski area on Killington Peak. After seeing that Killington had the potential to be "bigger than Stowe," Smith began seeking investors in 1955. According to Killington: A Story of Mountains and Men, at this point he met Joe Sargent, an investor in Mount Snow, who talked Smith down from initial plans of a cabin lift and three mountain peaks to a smaller upstart that could be more easily financed. The Sherburne Corporation was formed in April 1956. Meanwhile, there was no reasonable road access into Killington Basin. After extensive lobbying, the Vermont legislature agreed in 1957 to fund the Killington access road. Smith and his crew subsequently constructed a work road, cut lift lines, and took delivery of two Poma lifts. However, the state postponed construction of the access road, dashing any hope for a 1957-58 opening. On the bright side, Sherburne Corporation was able to finalize a lease with the State of Vermont. Construction of the Killington access road finally took place in 1958, while the state constructing a base shelter later in the year. As the season approached, the future of the ski area looked bright, as a Thanksgiving storm dumped two to three feet of snow on the mountain. 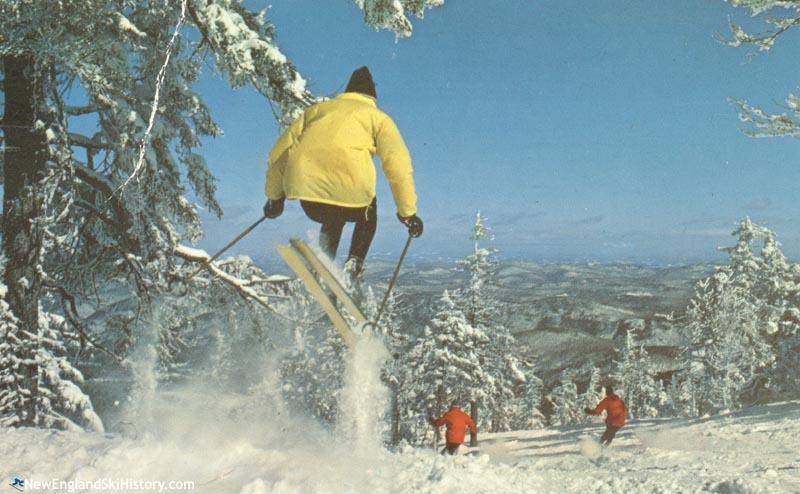 After years of work, Killington Basin ski area opened on December 13, 1958. Initially served by the two Snowdon Poma lifts, two more were constructed during the season, serving the novice slope and the upper mountain Glades complex. 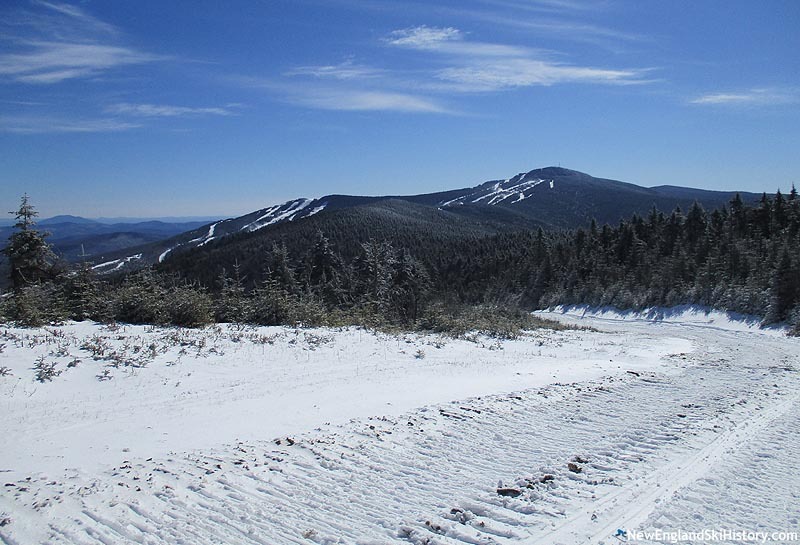 The ski area continued its ascent into the "big leagues" in 1960, when it expanded to Killington Peak proper with the installation of the 6,300 foot Killington double chairlift and three new trails. In just its second season of operation, Killington turned a profit. 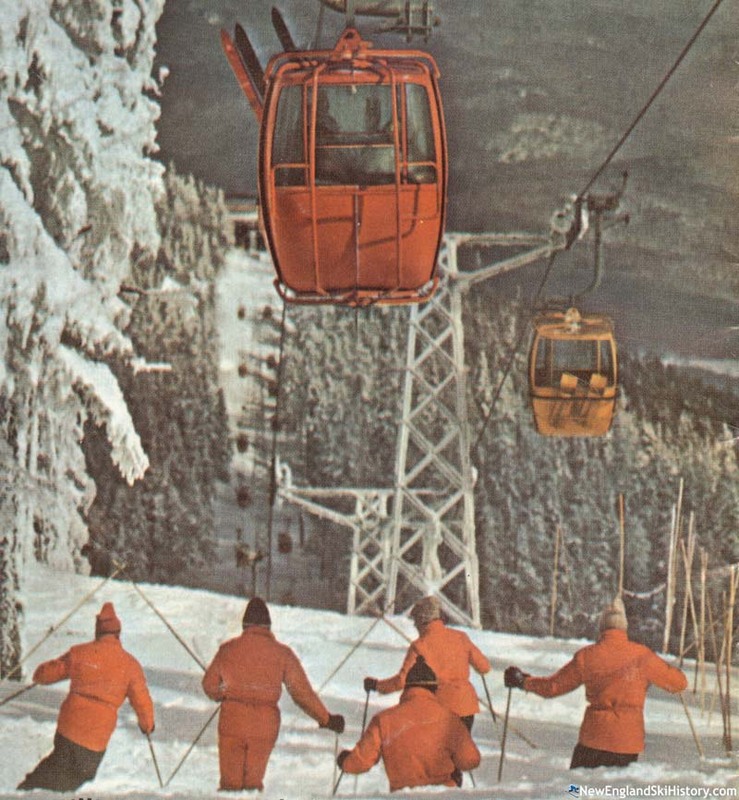 Beginner options were improved in the following years, as the first Snowshed chairlift was installed for the 1961-62 season, while sights were set on "North Peak." After a name change, the new peak debuted for the 1962-63 season as Ram's Head, providing more novice terrain. Looking for a hedge against lean years while also extending the ski season, Killington invested in a Larchmont snowmaking system for the 1963-64 season. The initial attempts at snowmaking were unsuccessful, as the aluminum pipe installed in the Snowshed area exploded under pressure. Nevertheless, Killington continued to improve the system. 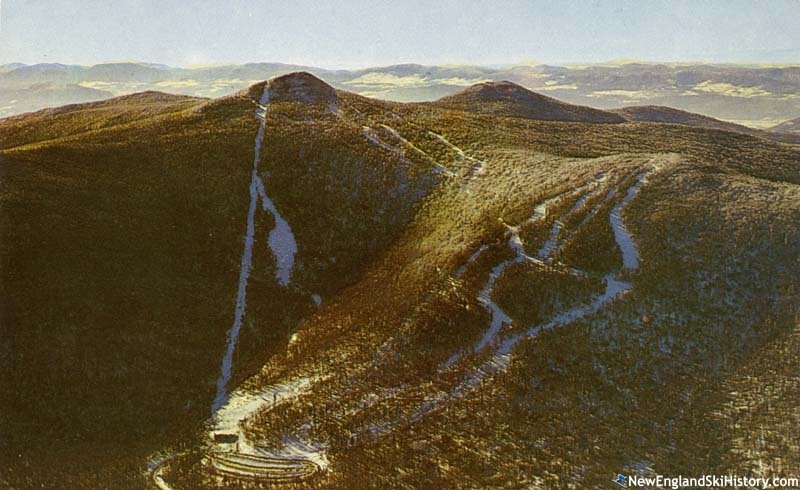 In 1964, Killington nearly exercised an option to purchase nearby Pico Peak. Over the next few years, additional chairlifts were added to existing pods as more and more skiers continued to flock to the resort. As a profitable and growing business, Killington invested in numerous initiatives, such as a news bureau, weekly accounting closes, and analysis of competitors via airplane. All the while, a huge development was in the works for the latter part of the decade. 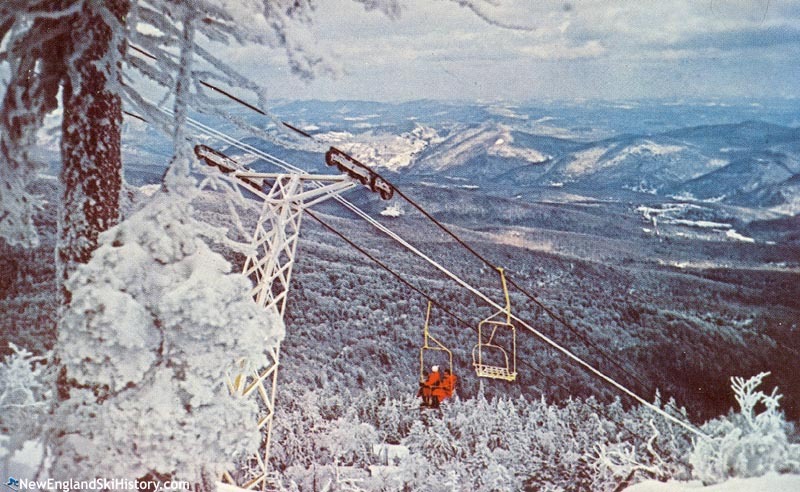 A multi-year project due to delays in constructing the longest gondola in the world, Killington East opened with lift service during the 1969-70 season. 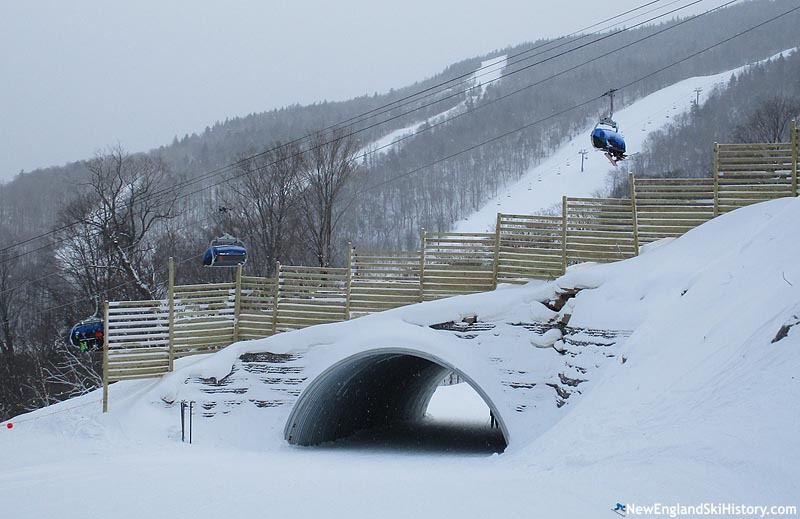 While cost overruns put Sherburne Corporation in financial jeopardy at the time, the project increased the vertical drop by 50% to over 3,000 feet, firmly cementing Killington as the largest ski area in New England. While Killington's early snowmaking focus had been on the Snowshed area, Pres Smith rolled the dice and installed higher elevation snowmaking on Snowdon for the 1971-72 season. Meanwhile, the first iteration of the Superstar trail debuted. Snowmaking was extended to the summit for the 1972-73 season. Killington continued to expand around the Killington East development later in the 1970s with the addition of the South Ridge and Bear Mountain complexes. Also during the 1970s, the ownership purchased Sunday River and Mt. Snow. One of the goals of installing upper mountain snowmaking in the 1970s was to extend the ski season into June. This was finally achieved in 1982, when Killington operated until June 15. For the next two decades, a June closing became the norm. Meanwhile, sights were set on Parker's Gore in the early 1980s as Sunrise opened, connecting the Bear Mountain area with US 4. Hitting its stride as the middle of the decade neared, Killington was in continuous operation from October 20, 1983 until June 21, 1984, marking 246 consecutive days of skiing. That fall, S-K-I Ltd. was formed, initially composed of Mt. Snow and Killington. While at the time it seemed liked Killington was on the verge of more big things, that fall also marked the narrow election of Madeleine Kunin as Governor of Vermont. With Burlington Mayor Bernie Sanders set to run against her in 2 years, Kunin quickly found her way onto the pages of the New York Times by going after big ski development, and specifically Killington. At one point, the Governor criticized Killington's water quality record, despite the fact the area had passed all of its state inspections. As a result of the new road blocks, Killington made no capital investments for the 1985-86 season, ending a decades long campaign of constant improvements. As Pres Smith told Ski magazine in 1985, "It's a disgrace for Vermont to have government officials say something that isn't even remotely true." Realizing that any significant expansion at Killington was now in jeopardy, S-K-I started to focus on expansion by acquisition. Carinthia was purchased in 1986, followed by what would become Bear Mountain, California in 1988. Three more areas were acquired in the first half of the 1990s. Meanwhile, S-K-I continued to stay on the cutting edge of ski technology with its snowmaking, information systems, and lift infrastructure. 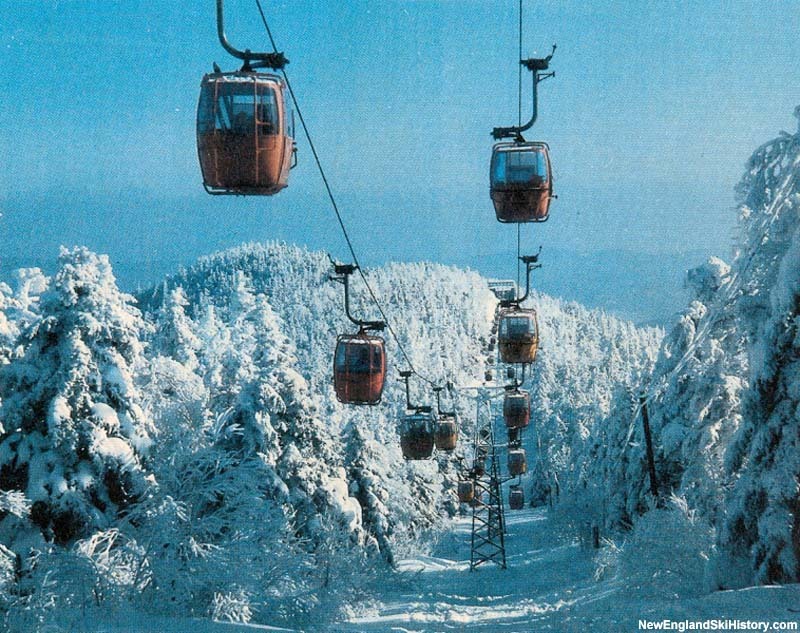 Killington installed its first two high speed detachable quad chairlifts for the 1987-88 season, followed by its first modern gondola, the Skyeship, in 1994-95. The American Skiing Company wasted no time in making a splash, as it installed three new quad chairlifts during its first year of ownership. Nearby Pico Peak was purchased in 1997, though plans to connect the two have never been completed. Meanwhile, Killington ceded its Parkers Gore holdings in exchange for base area land, the Pico interconnect, and snowmaking water from the Woodward Reservoir. The American Skiing Company's last new lift investment came in 1997-98, when it replaced the Killington chairlift with the K1 Gondola. While there was one last victory with the completion of the Woodward Reservoir snowmaking project in 2000, American Skiing Company was drowning in debt, leaving a sea of deferred maintenance behind. In 2007, Killington was purchased by SP Land Co., with Powdr Corp. taking over operations. The transition was not a smooth one, as controversy was stirred up due to the termination of lifetime passes, as well as the first April closing in over thirty years. Nonetheless, the area saw its first new chairlift in a decade when the Skye Peak Express was installed for the 2008-09 season. Season length was later addressed when the new Peak Walkway was constructed for the 2010-11 season, providing fall skiers with a foot route between the top of the K1 Gondola and the top of the Canyon Quad and North Ridge Triple. Following the 2010-11 season, Killington announced the replacement of the Peak Lodge. The $7 million project started that off season, as the old lodge was demolished. On August 28, 2011, Vermont suffered significant damage from Hurricane Irene. In addition to severe road washouts in the area, Killington lost a bar in the base area. Work on the summit lodge was slowed while repairs started elsewhere, including the construction of an umbrella bar to replace the lost building. After a seven year break, Killington returned to its late season dominance in 2012-13, when it stayed open through May 26. The Robert Carl Williams Associates designed Peak Lodge for the following season. An expansion of off season activities ramped up starting in 2014 with the debut of lift served mountain biking via the Snowshed Quad. Further attractions were constructed in 2015, including a ropes course, a Soaring Eagle ride, and a mountain coaster. Killington faced a big challenge in 2016 as it worked to host the first World Cup racing in New England in a quarter of a century. 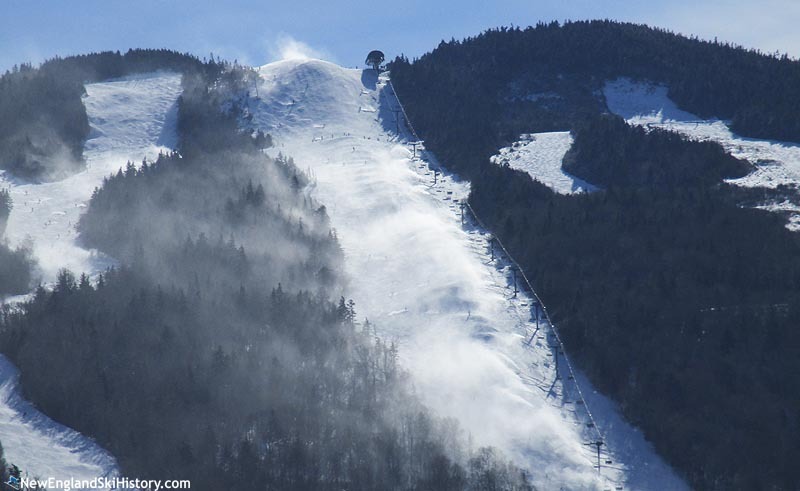 While western ski areas were forced to cancel their World Cup races in November, Killington flexed its snowmaking might by covering the Superstar slope top to bottom in less than optimal temperatures. New England native Mikaela Shiffrin won the Slalom event in 2016 and repeated the feat in November 2017. Citing advantages from tax reform, Killington embarked on a $25 million capital improvement campaign in 2018, including a new high speed six person bubble chairlift, two relocated lifts, K1 gondola improvements, snowbridges, RFID, and snowmaking improvements. Despite delays from abundant early season snowfall, the Snowdon Six Express debuted in early December. "I was director of ski patrol in the late sixties !" "Killington has actually offered lift-serviced mountain biking since 1991 on the Killington Double chair and later K1 gondola, making next week's opening the start of the 25th season of mountain biking at Killington!" "Monday, Feb 6. I was staying with friends at the Red Rob Inn (now the Killington Mountain School). We sat down for dinner at precisely 6:00 pm and we noticed it just started snowing...slow at first, but within minutes, it was snowing hard. Dinner was over by 7:00; we decided to walk to Charity's for drinks. There was well over six inches of snow on the ground as we walked there. When we left Charity's--around 10:00 pm, there was almost two feet of snow on the ground...and the access road was practically impassable. Cars were stuck everywhere. When we got back to the Red Rob, two ladies who left the hotel earlier that day (to drive home back to Boston)were inexplicably back at the Red Rob. 'Why did you guys return to Vermont?' we asked. 'They closed Massachusetts' was their answer. The turnpike was closed and the Massachusetts police said they would arrest any non-emergency motorists on the highways. When we woke up Tuesday morning, there was almost four feet of snow on the ground. Kenny Budzyna, the co-owner of the Red Rob calmed us down as we were dying to get to the mountain. Kenny advised us to sit tight: 'There's no rush to go the mountain,' he said. 'Too much snow and the lifts aren't open yet...they won't open until after 10 am.' He asked that we dig out our cars and empty the lot of cars so they can plow the lot. We got to the mountain around 10:30 am...and only a few lifts were running. The parking lot at Killington base was barely cleared of snow; just two bays, perhaps. We saw huge piles of snow that were foreign to us...we were amazed at all the snow there, being piled up as they plowed the lot. Killington 'regulars' were commenting that they never ever saw this much snow. They were still sweeping snow off the Killington Double chair. Most lifts sat still, or were moving very slowly so they could clear the mounds of snow off of each chair. The South Ridge triple didn't open until Wednesday...the mid-station two-bull wheel turn was buried in ten feet of drifts! We broke trails and snow all day Tuesday. The mountain was largely empty. Over 48 inches of snow fell. What a change from the icy conditions we experienced earlier that previous weekend. The snow remained excellent all week, through Friday. Boston Logan airport was closed for seven days. Killington remained empty even that following weekend because so many people couldn't get to the mountain. This was the winter of '78 where there were many storms..more than usual. I am told that this was the largest single dump in Killington history. I am glad that I was there...to experience nothing but powder and loose-pack powder day after day. The novice and many intermediate trails were almost impossible to ski until they were groomed...they weren't steep enough. A few trails (Conclusion, for example) had chest-deep snow. It was the most amazing ski day of my life at Killington...I've been skiing there for more than 40 years. Many other reminisce about that storm. I shall never forget the storm of my ski life...Feb 6-7, 1978. "